There’s a science to timing the market. And that science went into making Apollo Choice. Emotional traders tend to sell the winning stocks too early, keep the losing stocks too long and generally gamble too much on a stock that may not turn around anytime soon. Timing the market may be the name of the game but it’s not a game of chance you have to play. Because when you’re using our Apollo Choice product, you’ll be making decisions from a place of much greater certainty. 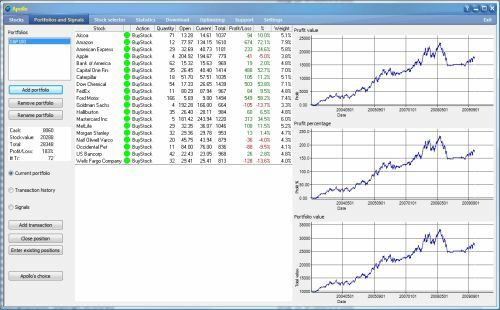 Apollo Choice simulates a portfolio of several stocks you can select. The product tells how much you would make with that group of stocks and grade their performance on a scale of 0 to 1000. Through a graph that tracks the collective stocks with clear color indicators, Apollo Choice will tell you when to Buy those individual stocks and how long to ride the upward trend. Can Apollo Choice prevent every stock from losing money? No. But it can minimize your losses if you act when you receive the signal to Sell. And that can be extremely valuable to your financial assets as well. Soon, the next version of Apollo Choice will feature a ping-to-email notification that tells you the precise time to Buy or Sell stocks in your portfolio.